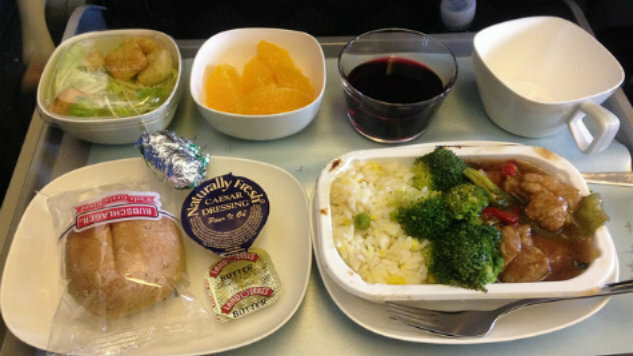 Centuries ago, during the presidential election between Barack Obama and John McCain, humorist David Sedaris wrote a great essay for the New Yorker in which he used an airplane food analogy to deride those agonizing over the choice at the last minute. I didn’t realize the piece was eight years old when I first read it recently, so I naturally assumed Sedaris was referring to the contest between Clinton and Trump. After all, the analogy fits even better this year; a glass-filled turd is a more apt metaphor for Trump than it was for McCain (despite his attempt to stick us with Sarah Palin). Sedaris’ point about undecided voters holds this cycle, too: How can anyone be undecided right now? Sedaris posits that it’s because they’re just too gloomy to care who wins. Are undecideds pulled between Trump and Clinton similarly thinking, ‘Eh, they’ll both screw stuff up, so whatevs’? “Ah, though, that’s where the broken glass comes in,” Sedaris snappily closes his piece. Touché. Once you’ve read some of these pieces—about how a President Trump could “deport freely,” “end the era of American global leadership,” and “wreck progress on global warming” — you begin to think that a plate of lacerating poop might be too mild a metaphor after all. I’ve heard the howls of the Johnson and Stein supporters when faced with the idea that asking for that banana split is tantamount to requesting that the plane crash: You can’t blame Trump on us! But the message here is not that asking for the banana split will necessarily make the plane crash, it’s that asking for the banana split is the same as not caring if the plane crashes. If you don’t take the option that stops the plane crash, you’re not helping stop the plane crash—you’re just dreaming of dessert while waiting to see whether things go down in flames. I’ll take the chicken, thanks. Katherine Gustafson is the author of Change Comes To Dinner, a book about sustainable food, and a contributor on food issues for Forbes.com. Her work has also also been published in Slate, Yes! Magazine, Utne Reader, and others. Photo by Yoshi Nagasaki CC BY. Preview image by torbakhopper CC BY-ND.